The city joining Peoria in banning electric scooters. TEMPE, AZ — Lime is pulling its electric scooters from Tempe saying the city's newly-adopted regulations and fees are too costly and put too much liability on the company. In a letter dated Monday, Feb. 11 , and addressed to Mayor Mark Mitchell and city council members, Lime said it had issues with the city's liability requirements, which it described as "unprecedented overreach" and "go beyond those in other cities by forcing operators to take on risk well beyond their control and outside the scope of its business operations." Within that, requirements to declare the scooters as "inherently hazardous" and to indemnify the city if it failed to maintain safe sidewalks or roads, according to Lime's letter . The company also took issue with the city's fees. Read Lime's letter in its entirety . In January, Tempe passed a licensee agreement for e-scooter and e-bike companies, that requires a $7,888 application fee, a "right of way use fee" of $1.06 per vehicle per day, and a $100 relocation fee. "I would have loved for Lime to have stayed. I think the more competition the better. We didn't write the regulations with the intention of driving any companies out," he said. "I like the scooters. I ride the scooters. I find them to be a really valuable asset to the city. The thing that we worked on and struggled with is there are negative effects right. Whether that's injuries to people, whether that's where they're parked, blocking sidewalks, A gates, accessibility; for good or bad, the scooters create costs to the city and we didn't think it was fair for all the residents to incur those costs." Granville said he is open to talking with Lime and addressing their concerns, but will not change his mind when it comes to people's safety or costs. "I'm not going to change my opinion on somebody, you know, paying their fair share for the burdens they create," he said. In its letter, Lime also said it looked forward to working with the city. "While Lime is leaving the City at this time, we remain deeply committed to continuing to serve Tempe customers. We look forward to working with the City to bring scooter requirements more in line with industry standards," the company said. 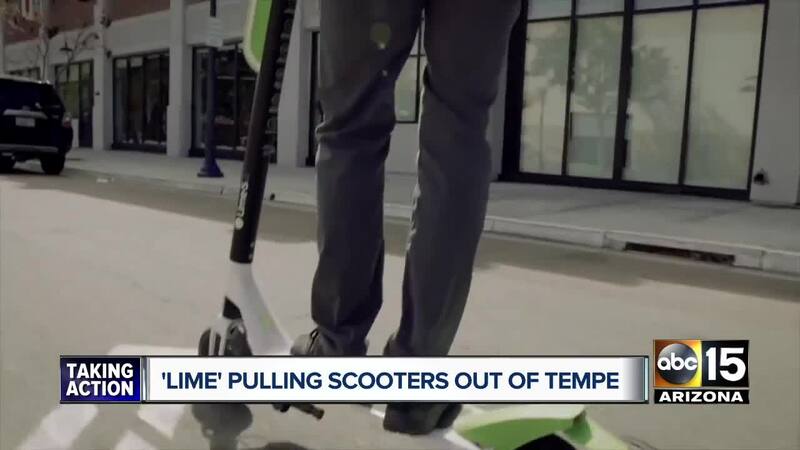 "While we regret that Lime feels they are unable to operate in Tempe under the current license conditions, the city does believe the insurance, fees and other requirements are fair and necessary to ensure the scooter companies operate in a way that ensures community safety and equal access," the statement said. You can read the city's entire statement below. In a statement Monday evening, Bird, another e-scooter company, said it had submitted its application to the city of Tempe and "we hope to continue to be able to serve the community." Many cities around the Valley have been working on ways to try and regulate the dockless scooter companies. Last month, Bird pulled its scooters out of Peoria after citing similar concerns related to costs and liability. Last year, Scottsdale passed an ordinance determining where the electric scooters and bikes could be parked, rider and how closely together. "Since Tempe City Council passed the Shared Active Transportation Vehicle license on Jan. 10, the city has received two applications, both of which are in review and currently pending. Although Lime chose to be a part of the stakeholder process, they have chosen not to apply for a license. While we regret that Lime feels they are unable to operate in Tempe under the current license conditions, the city does believe the insurance, fees and other requirements are fair and necessary to ensure the scooter companies operate in a way that ensures community safety and equal access. The license requires a per vehicle per day fee for use of the right of way. Revenue from this fee will be used to ensure Tempe’s streets and sidewalks are safe for all users by targeting safety outreach messages and Police Department education and enforcement. These funds could also be used to help improve Tempe sidewalks and streets, as well as fund future bicycle and pedestrian projects. The SATV license is a work in progress. We will continue to monitor and evaluate the success of the license and we will continue to work with stakeholders to ensure we are offering a safe, equitable and sustainable modes of transportation within the city."